In this week’s Friday Fundas I will be taking about a cinematography concept termed as Master Shot. A Master shot is a visual of the entire scene in which the action is taking place. For example in the Harry Potter series the shot involving the entire dining hall is an example of a Master shot. This forms the foundation for the next set of shots that comes. Many a times this also functions as the establishing shot as well. A master shot is usually a long shot that can cover the entire scene including all the characters, props and background. Another good example of a master shot is the scene from the movie Little Miss Sunshine where the entire family is sitting around a table for dining. This covers the entire scene and forms the foundation shot for the following scenes. In the early 20th century the master shot was predominantly used in movies. As movies and movie makers evolved from stage play, the shots in the early movies had more master shots which resembled the setup of a stage. In the later part of the 20th century this changed and film makers started to use more radical angles and subjectivity when framing the shots. This started bringing in a different level of connect for the audience to the characters on screen. Even in today’s films master shot forms a very important part of the filming process. These shots are frame of reference for the audience to set the context and environment a particular shot is taking place. Carefully placed master shots in the movies enhances the movie experience for the audience. Next time you watch a movie try differentiating between the master shots and other shots in the movies. Think if the master shots were not present how it would have been. What if you are watching a movie and it is quiet but for the dialogues from the characters. It will seem odd right. What makes you immersed in a movie? It is the sound effects that are added to the movie to mimic a realistic situation you would encounter in life. In this week’s Friday Funda I would discuss a sound technique used in movies called as Foley. Foley in short is the reproduction of everyday sound effects to be added to the movies. Let us consider a cop walking up down a corridor with floored with vitrified tiles. The sound of the footsteps is recreated by Foley artists. They have various types of shoes and floors with them to recreate the most appropriate sound effect. Feet – This involves the sound of the footsteps. Based on the shoe and landscape the character is walking an appropriate sound is reproduced. Cloth – This involves reproducing the sound of clothes. These are more subtle sound but add a lot of realism to the scene. For instance when a character is walking the rubbing of cloth on the thighs creates a sound which is reproduced. Props – These are sound from other items that are needed for a scene. These include sounds like doors closing, door bell ringing, car horn, train siren and so on. However these are usually picked up from the repository of sounds by the sound editors. Adding Foley sound to the movie after it is filmed gives the flexibility of adjusting it suitably to mix well with the scene. Sometimes a reverb or echo is added to the Foley sound based on the surroundings. Next time you watch a movie pay close watch to the various Foley sounds added to the movie. The movie screen space is a confined one compared to our real life vision. It gives the ability to take a limited view of the scenery and present it to the audience. What the audience view is what has been captured through the camera. The camera position, viewing angle and the position of the characters on screen all of these play a vital role in making the visual effective. Many a times you see a homemade video and wonder that there is something that is not right. If you watch it close then it might be how and where the camera was placed. In order to make effective visuals there is basic grammar called the Rule of Thirds. Again as it goes with many other rules many of them have broken this rule as well, but not before understanding its purpose. This week’s Friday fundas I would be talking about rule of thirds which deals with framing a visual. Often when you see people taking vacation photography they keep the object of focus in the center of the screen. Even the Horizon lies in the dead center of the screen. Next time you click a photograph try and adjust your camera to keep the object on the one third of your frame and see what effect it brings. This is what rule of thirds is all about. This applies to movies as well. To understand the rule of third you would need to divide your frame into 3 equal halves both horizontally and vertically. The object of focus is placed along the one-third line. For example if you have a character speaking you place the character on the vertical one third line and the eyes or forehead of the character along the horizontal one third line on top. This eliminates the empty space over the head and to the side of the character and enhances the visual along with the surrounding. The shot shown above is from the movie The Prestige. See how the character Christian Bale is placed on the one third of the line with a sharp focus. Sometimes you would need to break this rule or rather I would say adjust this rule to have the character in the center of the screen to focus attention. Still keeping the top of the character to the one third of the screen is important to eliminate the empty space. Although this looks simple it is very important to remember to use this rule when capturing a shot. As an experiment you can take the photographs you have shot and see how you have positioned the object of focus. Next time you take a photo try applying rule of thirds. In last week’s Friday fundas I had discussed about the 180 degree rule that is associated with the spatial relationship of the characters on screen. I had discussed about a scene in which two characters are talking to each other. Now consider the same scene is shot by alternating between the close up shots of each character as they talk. In reality this shot could be taken with covering all the dialogues of one person first and then covering the responses. During editing these are arranged in proper sequence. One of the items to take care when doing such a scene is Eyeline Match. In this week’s Friday fundas I would talk about Eyeline Match. Eyeline Match is a movie editing technique. Whenever a character on screen is looking into the off screen space then audience would want to follow the gaze of the character. They would want to see the object, person or scene the character is looking at. Hence this is normally followed by a cut to the scene involving the object, scene or person the character is looking at. In our conversation scene character A is talking to character B. Now the shot involving character A talking is taken first. It is important to match the eyeline of character A such that it gives a feeling that the character is looking at B. Usually the actor playing character B is placed off camera for the character A to look at. Sometimes there is a mark placed off camera on which the character A focuses on while delivering the dialogue. The same technique is employed when taking the shot of character B responding to the conversation. In this case the camera is placed on the opposite direction. Now we know there is a 180 degree rule governing this. As we are going to focus on a different character there is no rule broken here. However in order to get the eyeline match right the same camera lens is maintained and also the camera is placed equidistant from the 180 degree axis as the previous shot. For instance if the camera has been placed 3 feet from character A then the same distance is maintained for character B during the next shot. 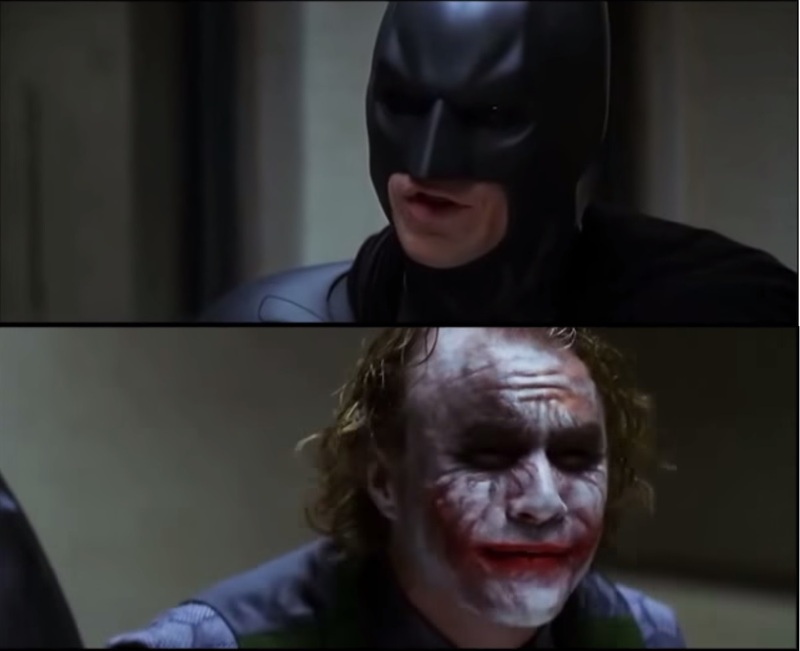 Look at the following two shots from The Dark Knight movie where Batman interrogates Joker. The eyeline match makes it look they are looking at each other and talking. At the editing table when the editor assembles these shots in order it appears to be a continuous flow of sequence for the audience. They feel that both characters are conversing with each other. However if these positions are not maintained correctly the characters would seem disconnected from each other and so would be the audience from the scene. Although this is a simple technique, when followed right it would create a pleasant visual. In the previous Friday Fundas section I mentioned Cinema is a magical medium and how optical illusion can create perceived reality with techniques like Forced Perspective. One of the readers had asked an interesting question on how scenes similar to Kumbakarna and the tiny soldiers, Gulliver and Lilliputs are made. While some of the scenes may be forced perspective but the scenes which involve the Lilliputs walk over the giant body of Gulliver is covered by what is known as the Chroma Key Compositing or Chroma Keying Technique. This also popularly called as the Green Screen effect or the Blue screen effect. The basic of Chroma Key is overlapping two images and make them merge with each other. Let us consider the flying action of Superman and the image of sky behind him. As images are built of pixels you would want to replace the background from the image of superman in flying action with that of the image of the sky. In order to achieve it you would want to make any pixels around Superman transparent. Well Chroma Keying is the technique to do that. The technique involves choosing certain color range of pixels and making it transparent. In the initial days this was done using a blue screen at the background and then blue color was made transparent to merge with another frame to make it look like they are happening in the same space. It should be noted that no other character or object in the first scene should have blue color. As Superman has a blue costume instead of a blue screen a green screen could be used. In the modern days a green screen is used prevalently as the image sensors in digital video cameras are more sensitive to green there by allocating more pixels to green channel. Prior to the digital era Chroma Key was also performed on the films. It was popularly referred to as Matte technique. The technique is as old as 1930s. The scene comprises of two scenes one the foreground shot and the other the background shot. The background of the foreground shot when taken would be a blue screen. Now the camera color negative of this shot was printed onto a high contrast black and white film using either a filter or the black and white film to limit the blue color. The resultant film produced transparent color wherever it found blue. The end result is the foreground object with a transparent background. This is called the “Female matte”. This was now copied onto the high contrast negative of the background scene which is called the “Male matte”. The end result is the negative of the film with both these scenes merged with each other. One of the key challenges in this technique was camera movement. The camera movement used when shooting the foreground should be used exactly the same way while shooting the background scene. Later techniques were developed to automate this process to move the camera exactly the same way. Well next time you see Superman fly or Batman jump across buildings you would remember there is always a Chroma Key behind it. Have you ever taken a picture standing in front of Taj Mahal or Washington mall monument actually far away from it and rising up your hand so that the photo looks like you are holding the tip of the monument or tried to take the photo in an angle which appears like you are holding the sun in your hand? I am sure these images strike a bell to you… Well if you have taken these shots… then you have employed a popular technique of optical illusion in movies known as the Forced Perspective. In this week’s Friday Fundas let us look at the amount of magic this simple technique can create. Optical illusion forms a major part with visual effects in Cinema. It is like a magic show, constructing a scene in a certain way revealing certain portions while hiding the rest to create an illusion. In the Forced perspective the depth of field gets hidden from the viewer. Like in your photo with Taj Mahal you don’t see the distance between the person and the Taj Mahal so you feel they are holding it. Let us look at some examples in the movies. Consider a movie like the Jurassic Park. Minatures of Dinosaurs had been used in many shots. Have a miniature dinosaur very close to the camera and a person far from the camera. The camera angle is such that it covers the shot so that it appears that the dinosaur is looking down the person while the person is looking up. Lighting plays an important role with the forced perspective. Both the objects in the scene should have the same amount of lighting so that they actually appear standing close to each other rather than standing apart. As you know light’s intensity decreases as it moves farther away. So the power of lighting should cover the near and far object sufficiently. If not you would reveal the actual distance and there would be no more illusion. Another example is Hagrid’s character in Harry Potter who is tall as compared to the others. Forced perspective was employed to shoot these sequences. Cinema is a magical medium. The tricks have to be performed the right way to make the show successful. A lot of thoughts go into designing the techniques, and it does involve a lot of science not just art.